Carlos Noriel Lee (born June 20, 1976) is a former professional baseball first baseman and left fielder who played in Major League Baseball from 1999–2012 with the Chicago White Sox, Milwaukee Brewers, Texas Rangers, Houston Astros and Miami Marlins. He had 17 career grand slams, ranking him seventh in MLB history (tied with Jimmie Foxx and Ted Williams). Lee made his major league debut with the Chicago White Sox on May 7, 1999, hitting a home run in his first Major League at-bat. In his rookie year, Lee hit .293 while driving in 84 runs in 127 games. He finished 7th in the AL rookie year voting. In 2000, Lee drove in 92 rbi's while hitting 24 home runs. In 2001, Lee once again hit for power, hitting 24 home runs and driving in 84 runs but his average dipped, from .301 the previous year to .269 in 150 games. In 2002, Lee played in just 140 games but was consistent once again, driving in 80 runs while hitting 26 home runs. In 2003, Lee had his breakout season for the White Sox, playing in 158 games, Lee drove in 113 rbi's while homering 31 times and scoring 100 runs. The following year, Lee continued his success, hitting 31 home runs and scoring 103 runs. He also drove in 99 rbi's while hitting .305 for the White Sox. After the season, Lee was traded to the Milwaukee Brewers in exchange for outfielder Scott Podsednik and pitcher Luis Vizcaíno. Lee's best showing was in the National League with 114 RBIs. He was selected for the National League All-Star team in his first two seasons as a Brewer, and participated in the Home Run Derby in 2005. 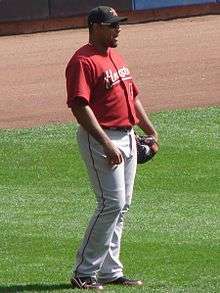 On July 28, 2006, he was traded to the Texas Rangers with minor league outfielder Nelson Cruz for outfielders Kevin Mench and Laynce Nix, relief pitcher Francisco Cordero, and minor league pitcher Julian Cordero. According to Brewers General Manager Doug Melvin, the Brewers attempted to re-sign Lee, but by July 27, it became apparent he would not sign a contract extension. The Brewers reportedly offered a four-year, $48 million contract extension, close to the four-year, $50 million extension David Ortiz signed earlier in 2006. Lee's agent Adam Katz said the two parties were too far away in negotiations. In 59 games for the Rangers, Lee hit 9 home runs while hitting .322 while serving as their DH and left fielder. Between both the Brewers and the Rangers, Lee hit a career high 37 home runs while driving in 116 rbi's in 161 games. On November 24, 2006, Lee agreed to a six-year, $100 million contract with the Houston Astros. Lee had a productive first year in Houston, hitting .303 with 32 home runs and driving in 119 runs, which was good for a three-way tie in the National League with Miguel Cabrera and Prince Fielder. In his second year, despite playing in just 115 games due to injury, Lee drove in 100 runs and homered 28 times for the Astros. In 2009 he had the lowest range factor of all starting major league left fielders (1.56). Despite his limited range, Lee was a force once again at the plate, driving in 102 rbi's while hitting exactly .300 in 160 games. In 2010 after Lance Berkman was traded to the New York Yankees, Lee played a handful of games at first base. While this was not the first time in his career he had played first, it was the first time he did so on a regular basis. Lee hit a career low .246 despite driving in 89 runs and homering 24 times for the Astros. In 2011 he was an above average defender according to UZR and other statistical measurements. Through 66 games in 2012 for Houston, Lee struck out just 17 times in 258 at bats. During his 6-year tenure with the Astros, Lee never struck out over 65 times in a season. On July 4, 2012, Lee was traded to the Miami Marlins for minor leaguers Matt Dominguez and Rob Rasmussen. He played his first game as a Marlin the next day against the Milwaukee Brewers, and went 2-for-4 with a run in a win. He hit his first home run as a Marlin, a grand slam, on July 17 against the Chicago Cubs. In 81 games for the Marlins, Lee failed to produce as Miami expected, hitting just .243 while homering just 4 times in 338 plate appearances. In reference to his nickname, Carlos has a fan club called "Los Caballitos," which means "Little Horses." He is married and has two daughters, Cassandra and Karla and two sons, named Carlos and Carlito. Lee owns and operates cattle ranches in Aguadulce and Houston. His younger brother, also named Carlos, Carlos Humberto Lee, played professional baseball in the Chicago White Sox and Milwaukee Brewers' minor league systems from 2001–2007. ↑ JS Online: So long, slugger Archived August 10, 2006, at the Wayback Machine. ↑ Rich Kraetsch. "Bad Paper: The 10 Worst Contracts in the MLB". Bleacher Report. ↑ "The Worst Contracts In Baseball (Spring Training '09)". ↑ Joshua Fisher. "The worst contract in baseball". The Hardball Times. ↑ "Baseball Toaster: Mike's Baseball Rants : Intestinal Dreifort-itude". ↑ "Archived copy". Archived from the original on 2010-08-16. Retrieved 2010-08-08. ↑ "Carlos Lee » Statistics » Batting – FanGraphs Baseball". ↑ DAVID BARRON, Copyright 2007 Houston Chronicle (18 May 2007). "Fans of Lee stick with their horse". Houston Chronicle. Wikimedia Commons has media related to Carlos Lee.